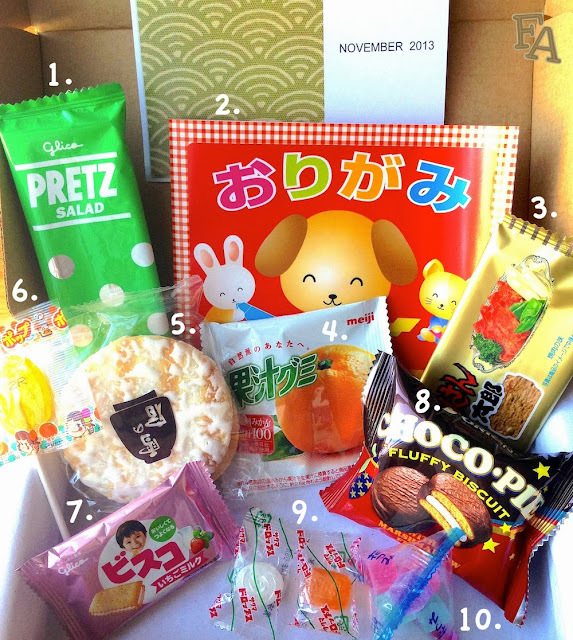 Visit Skoshbox to get your own monthly box of Japanese treats! *Smalls & I both liked these a lot. 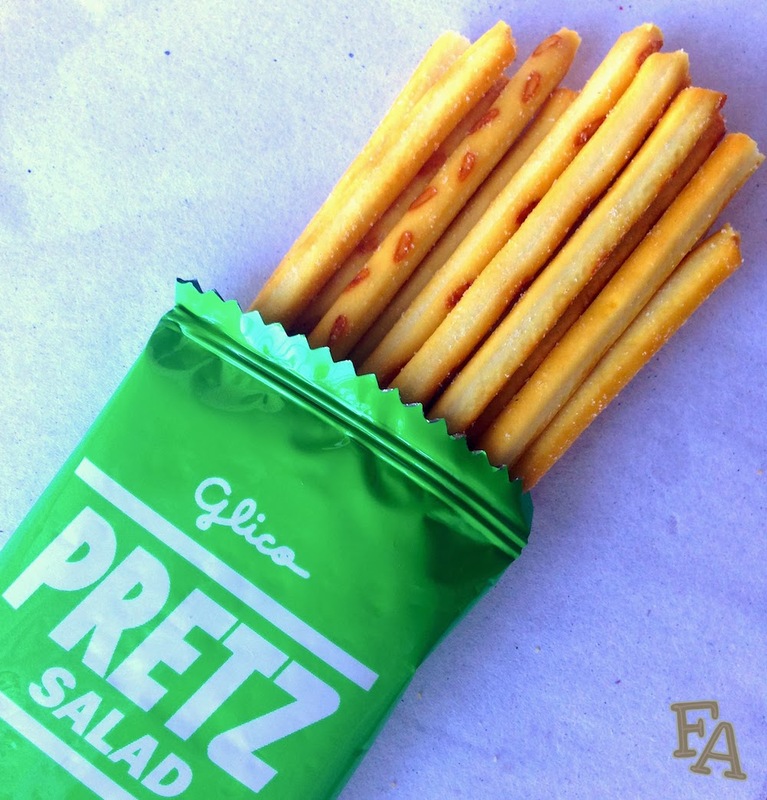 The sticks break off nicely between the front teeth & the flavor is buttery with light salt & maybe a hint of Italian dressing? -10 squares of brightly colored origami paper, including silver & gold! *This was a nice non-edible surprise as I totally love origami. 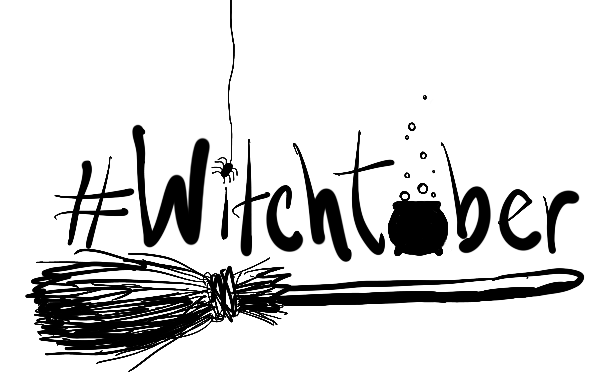 I haven't done it in a while, but I grew up on it (that & scherenschnitte) & have probably made enough paper cranes (& other animals) for at least a few wishes. 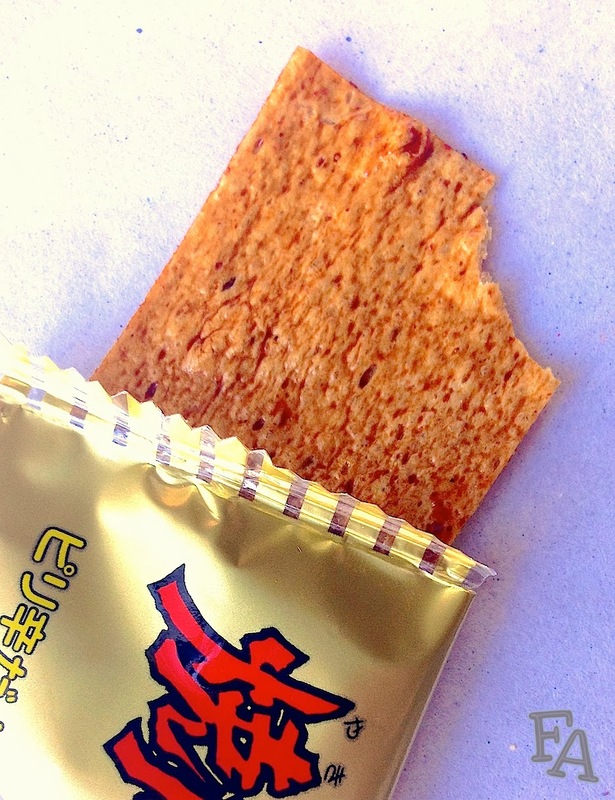 -Thin, wide strip of compressed meat in either beef or eel flavor, thinly coated in a slick, savory seasoning. *This is an interesting item. I'm pretty sure I got the eel because there was a slight sea flavor. The texture is like a very thin piece of dense foam but it's not all together terrible because after each bite I took I was intrigued to try another. It's hard to explain. 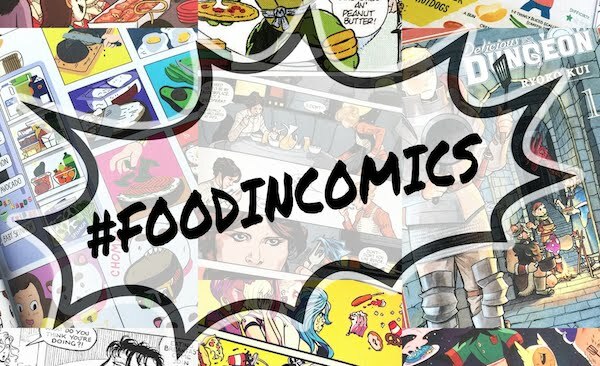 The flavor is not strong in small bites, but if you take a larger bite you get a kick of spice. 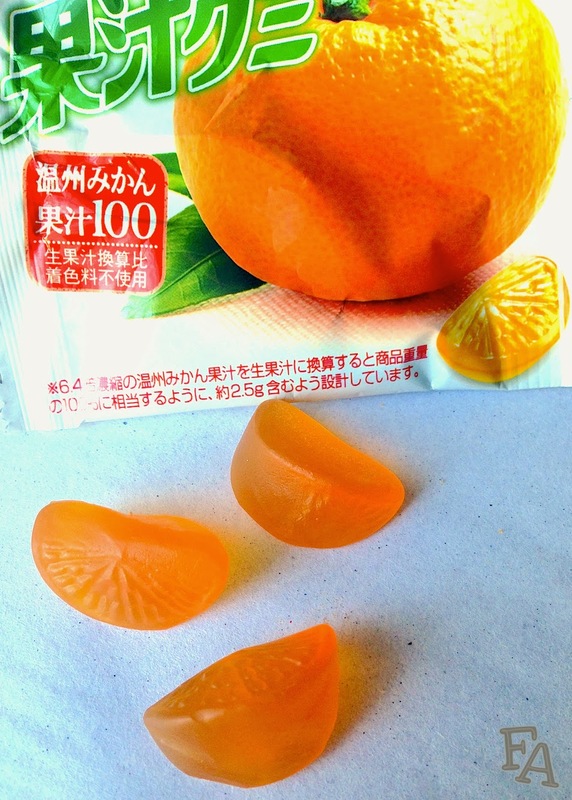 -Several little gummy pieces in the shape of orange slices with a strong orange flavor. *I was really impressed with the wonderful tangerine smell that sprang from the pouch as soon as I opened it. The gummies too are pleasantly strong in the flavor department with even a very subtle citrus twang on the roof of the mouth after the gummy is gone. -2 thick puffed rice rounds, lightly salted on one side & drizzled with sweet icing on the other. *I. Love. 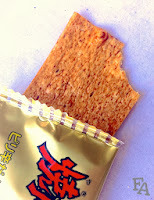 Senbei. These were amazing. If you eat it savory side down so that your tongue tastes the very light dusting of salt first & then the sweet of the icing drizzled on top, after you bite through the airy rice cracker part, it's exquisite. -Flat, oval hard candy lollipop with a distinct lemon flavor. *There's not much to say about this because it's a common lollipop, but the lemon flavor is nice & refreshing & the shape of the pop sits in the mouth very easily. -2 tiny snacks in one package; light strawberry flavored cream sandwiched between flaky cookies/biscuits. *There was an immediate smell of strawberry when I opened the little package but I couldn't really taste the strawberry in the cream when I bit into the snack. The cookies/biscuits are very light & airy with little to no flavor. These were all right but not really notable. 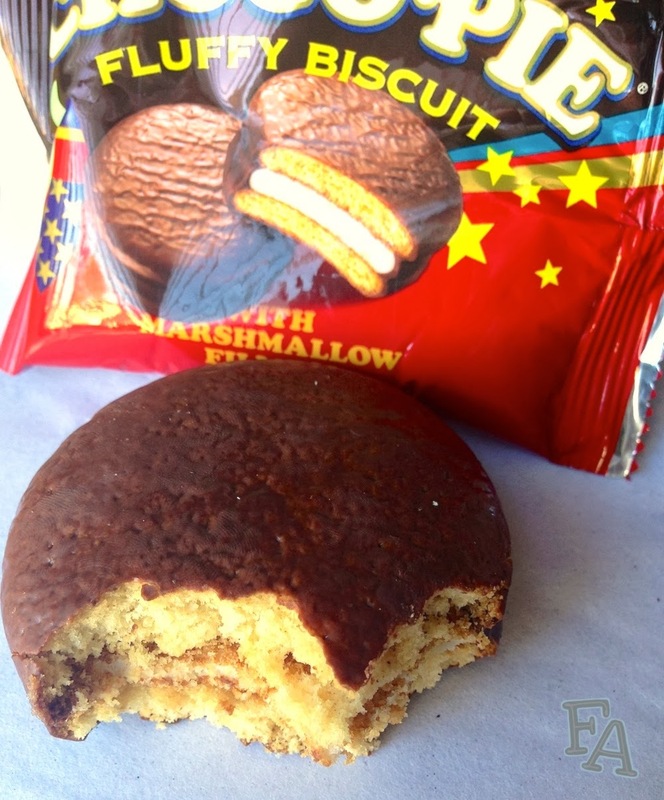 -Crumbly, cake-y cookies with chewy marshmallow in between, all thinly coated in chocolate. Actually from South Korea. *This was pretty dry & not very exciting. The marshmallow is a processed chewy texture that I didn't care for & the cake/cookie parts are so crumbly. They are fluffy though. -Small hard candy with various flavors & shapes. 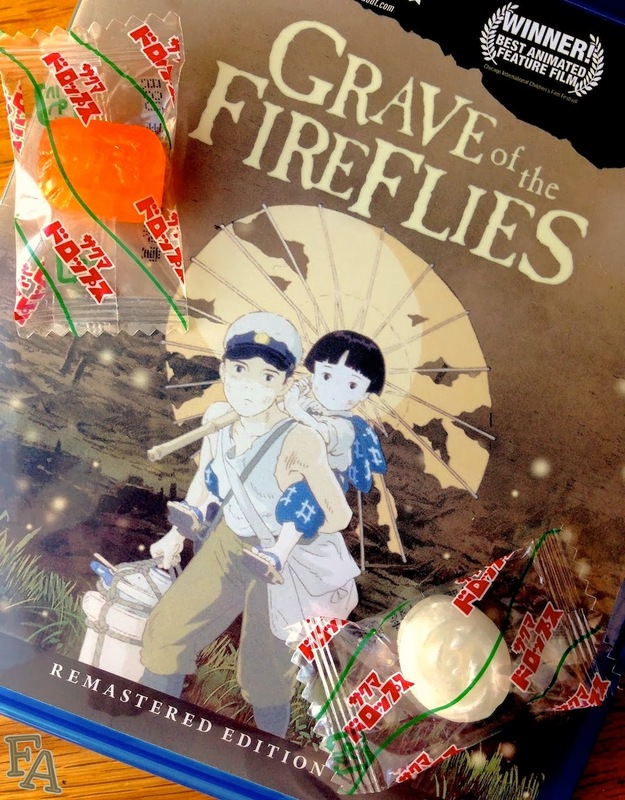 *This is the candy that was featured in the Studio Ghibli film "Grave of the Fireflies". 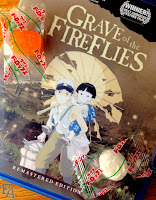 The candy in the film was in a tin though whereas I received 2 individually wrapped pieces. A white piece with a strong & refreshing mint flavor was shaped like a beautiful little bloomed rose & the orange piece with a distinct orange flavor was a rectangle shape with Japanese text on it. Very impressive little candies! -Several small cubes of colored jelly coated in tiny sugar crystals. *These are really fun little gummies. They are toothsome (? ), like the texture is one where your teeth nicely slice through. The flavor is so subtle you can hardly tell, but it's kind of floral. The colors of purple, pink, & blue are very eye catching/aesthetic (Smalls zeroed in on these little candies & kept asking for the blue one).